That is, until I actually went on my long awaited trip and discovered getting around is a major part of travel! Other important daily decisions are deciding what to eat, where to sleep and what to do:-). Anyway, deciding where to go next and researching how to get there can take up significant amounts of your time. Important factors are usually the amount of money, effort and time you are willing to spend to get to your desired destination. And obviously, going to a place where many people travel will be easier than reaching an off-the-beaten-track local tribe market taking place just once a year. 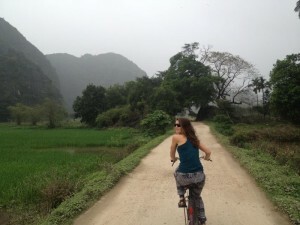 Traveling and getting around in Vietnam is pretty easy. There are many options to choose from (flights, night trains, night buses, minivans, taxis, motor tours, etc.) and plenty of tour operators offering tickets to each of those options. Nevertheless, to inspire you to visit this wonderful country and to make getting from A to B in Vietnam a little easier I wrote this detailed 1 month Vietnam itinerary. In the map below you can find the route, accommodations and highlights of our 30 days in Vietnam. I traveled from North to South (from Hanoi to Ha Tien where I crossed the border to Cambodia). 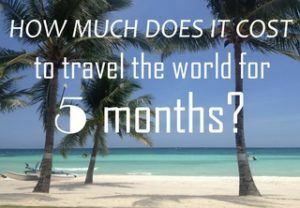 If you want to know more about the costs of my Vietnam trip, check my budget breakdown post. You can find all the details of our trip (highlights, transport information, where to stay) below. 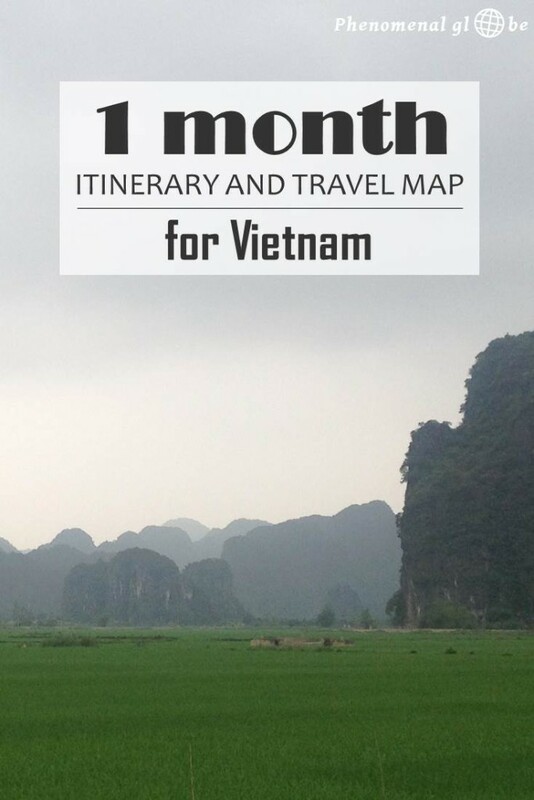 At the bottom of the post you can download the map as a pdf to take this with you on your trip around Vietnam! Because we landed in the middle of the night, I hadn’t seen anything of Vietnam yet, other than the airport (and airports are all the same). Therefore, I was delighted to discover that Vietnam looked and felt completely different than the Philippines. The weather was a bit disappointing, it was freezing! Okay, not freezing, but it certainly felt like that after weeks of tropical heat in the Philippines temperatures. But nothing could contain my enthusiasm about arriving in a new country, ready to be explored! Starting with my introduction to Báhn Mì, now one of my favorite foods! I am always searching for Báhn Mì in the Netherlands and other places in the world (though it never tastes as good as in Vietnam;-). Anyway, from Bong Sen Airport guesthouse (not a recommended place to stay, read more below) I made my way to the airport, about 15 minutes on foot. There I quickly spotted the Vietjet airport shuttle bus, which dropped me off at Hoan Kiem Lake in Hanoi city center for 40.000VND. The price is clearly listed on the side of bus, no bargaining needed! I spend two days exploring Hanoi on foot, went on a two day cruise to Halong Bay, took a tour to the Perfume Pagoda and another tour to Hoa Lu and Tam Coc. Check out all the activities I did in Vietnam. After three wonderful weeks in the Philippines, we arrived around 2am in the night at Bong Sen Airport guesthouse and were very happy that after knocking on the closed door a very sleepy woman let us in. The room was very basic, but we were so tired after a day of traveling we didn’t mind. 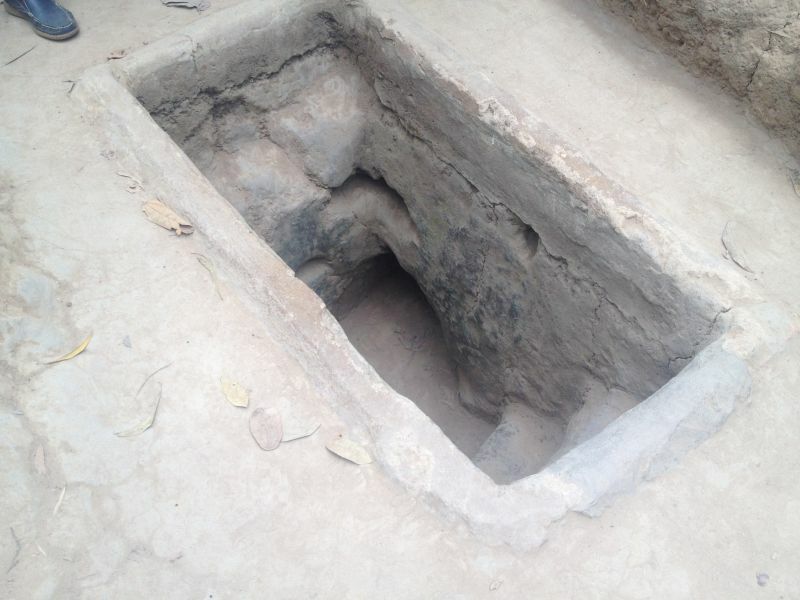 The bed was really hard though… It is close to the airport; however, I would not particularly recommend this place (thus no Agoda link provided). Paid price per night: €10,37, no breakfast included but Banh Mi available on to the road to the airport. The first hotel in Hanoi we stayed at was the Hanoi Serenity Hotel, a nice place in the middle of the Old Quarter. The friendly staff gave us a convenient little city map and told us a lot about Hanoi. We got an upgrade to a bigger room that had a bathroom with a bath! Small downside: there was no shower curtain making the entire bathroom sort of a swimming pool when taking a shower, but not a big problem. We wanted to stay another night but unfortunately the hotel was fully booked. We were supposed to stay at the Tourist Hotel the next day, but upon arrival we were told the hotel was fully booked. They led us to another hotel down the street, I have no idea what the name of that hotel was. The girl behind the reception was great though and booked us tickets on the night train from Ninh Binh to Hue (for the actual price of the ticket, not with a big service fee added:-). Paid price per night: €11,48, including breakfast (we did have breakfast at the Tourist Hotel and not at the hotel we slept. It’s Vietnam, just go with it;-). After going on a cruise in Halong Bay we returned to Hanoi for another two nights and stayed at the Golden Orchid hotel. I have to be honest: the bed was terribly uncomfortable (you could feel the springs), therefore no link provided either. We asked for another sheet and slept on the thick blanket which made it a lot better. On the positive side: the staff was super friendly, the shower was great, there was a water cooker and breakfast was excellent. After a day of exploring Tam Coc by bicycle and saying goodbye to wonderful Tuan Ngoc Hotel, it was time to leave for my next destination: Hue! I took a cab to Ninh Binh train station, where I got on the night train to Hue. I was surprised how well organized everything was: about 15 minutes before the train arrived a soft bell went off and a railway employee checked my ticket. She explained where I had to stand on the platform to enter the cabin listed on my ticket! The 4 person soft sleeper cabin was pretty comfortable, I got a good night sleep:-). • Book a couple of days in advance! Beds sell out fast, particularly the soft sleepers. • Ask your hotel to book tickets for you instead of paying large fees at travel agencies. The only additional fee I paid was the ticket delivery fee. Yes, the train company delivers your tickets to your hotel, I couldn’t believe it either when I found out! Anyway, when I arrived in Hue after the comfortable train trip, I took a cab to Hue Charming Hotel. If you have time, cut the journey between Tam Coc and Hue in two and visit Hang Son Doong, the world’s largest cave along the way. I loved this cute little place in Tam Coc! After spending some days in busy Hanoi, our stay at Tuan Ngoc Hotel in chilled out Tam Coc was a nice change of pace. The family who runs the hotel is incredibly friendly and really makes you feel at home. All the food was delicious and fresh. The bed was very comfortable, Wi-Fi was good and you can get all the tea and coffee you want during the day. 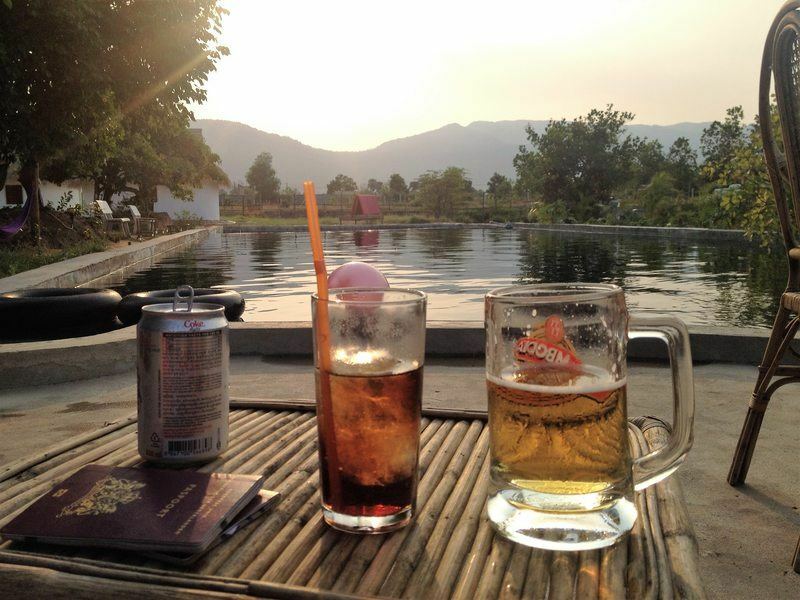 Excellent stay, couldn’t be better, definitely one of my favorite places during out month in Vietnam. We received such a warm welcome at Hue Charming Hotel! A cold towel, fresh fruit, juice and information about Hue and the places of interest in the city. Small but comfortable room. Bicycle rental for $2 a day. Great breakfast and cold fresh juice each time we stepped into the hotel. I spent two lovely days in Hue, the capital of the Nguyễn emperors. Read more in my activities post. I had asked the hotel how to get from Hue to Hoi An. No problem, they exclaimed, we have a minivan that can take you there for $15 per person. Not feeling like looking around for hours to save $1 or $2 I agreed. When I was picked up the next morning, the minivan was still empty. But as always in Southeast Asia, that quickly changed as more and more people were piled into the van. After driving for about half an hour the phone of the driver went off, he had a short chat and pulled over. When one of the passengers asked why we had stopped the driver cheerfully said that more people were coming. Apparently, they had forgotten to pick up two people in Hue, who were now on their way to our location in a cab. After some waiting the two missing passengers arrived and after some more waiting and rearranging of luggage we took off again. A friendly Vietnamese guy starting talking about the surroundings, which the villages we passed and some historical facts. Interesting, I thought, but why exactly is he telling this stuff? It turned out he was our guide. Yes, apparently, I did not just book a trip from Hue to Hoi An, I booked a tour! 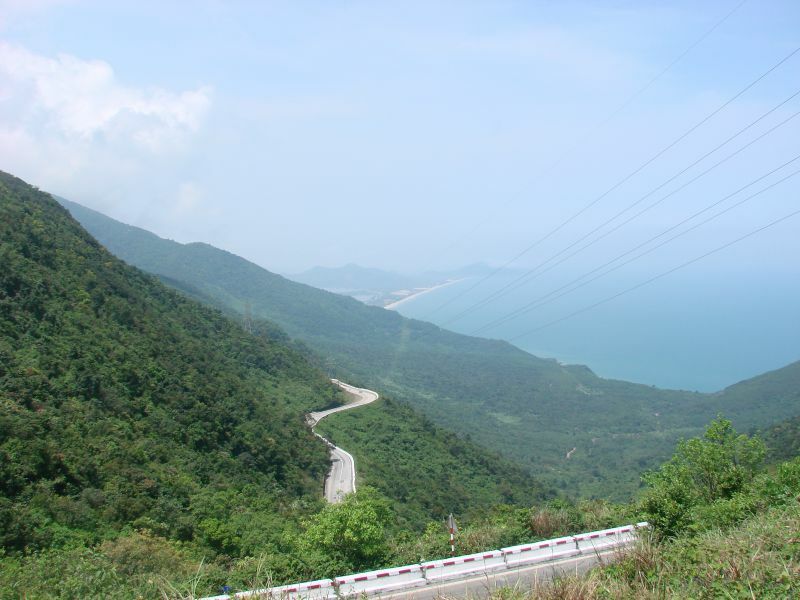 We stopped at Hai Van Pass, a 600 meter high pass that gained instant fame when Jeremy Clarkson declared it ‘A deserted ribbon of perfection’ in the Vietnam special of Top Gear. Beautiful? Definitely! Deserted? Not so much. We also stopped at the Marble Mountains, which turned out to be very interesting (read more here). I got to Hoi An eventually, around 5pm (it’s a 150km trip from Hue which would normally take about 3 hours;-) and immediately fell in love with the gorgeous Old Town. 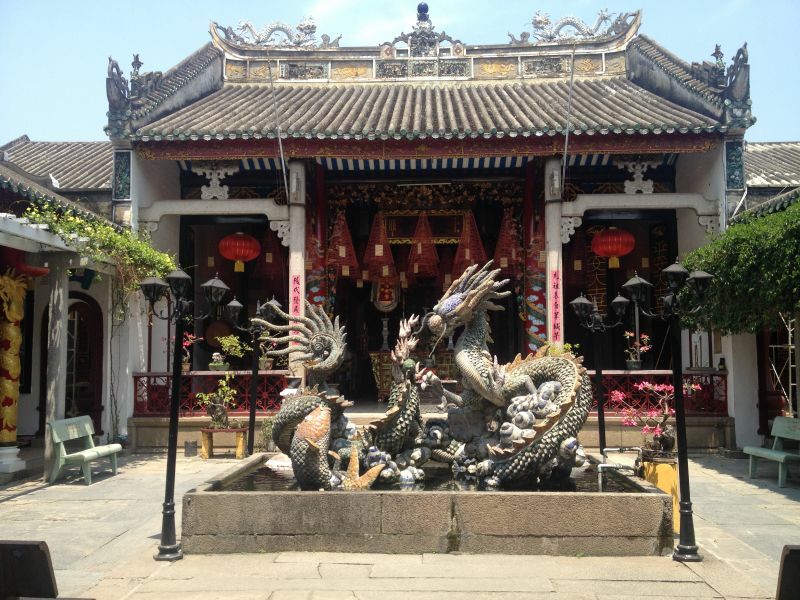 I ended up spending a week in Hoi An, a lovely town with great food and a very relaxed vibe. And of course it helps that by night the village feels like a fairy tale town with the pretty colored lanterns everywhere. To visit the historic buildings in Hoi An Old Town you buy a ticket for 120.000VND at one of the ticket booths spread around town. The ticket gives you entrance to five historic buildings. There are 22 sightseeing places listed on the map you get when buying the ticket so choose carefully. On the ticket it says that it is valid for 24-hours only, but we used the same ticket on Monday and Wednesday without any issues. During our week in Hoi An, we also did a cooking class (at Kiman Hotel). 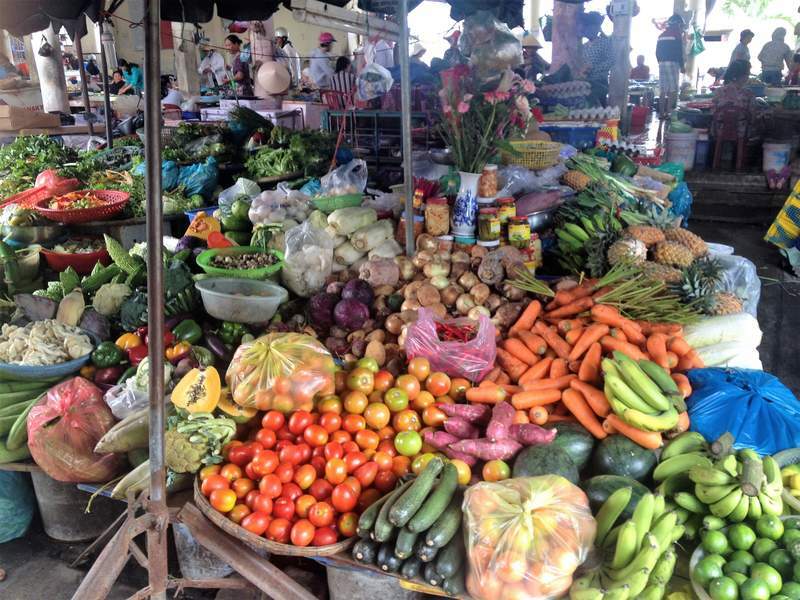 We visited the market first, to buy ingredients for the fresh spring rolls and the sauteed chicken that we learned to cook in the class. 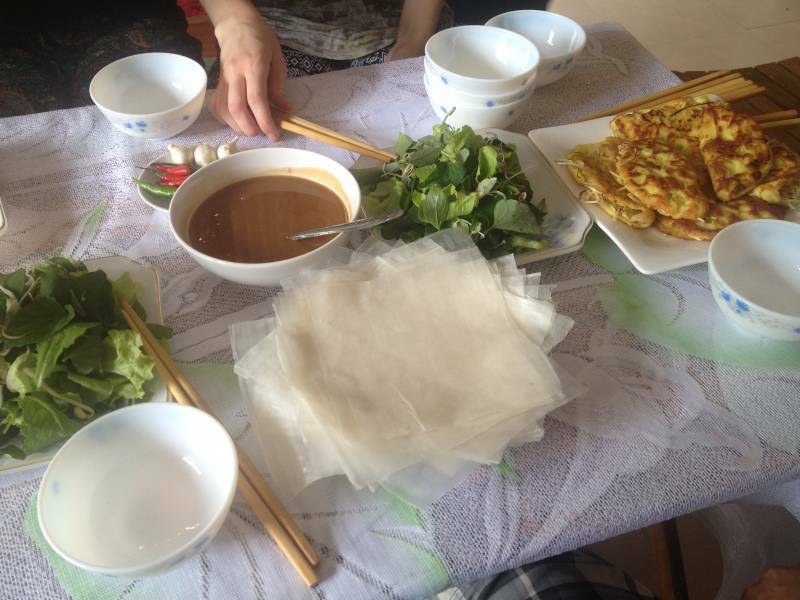 I absolutely love Vietnamese food and it tasted even better when we had prepared it ourselves! One of the best things about Hoi An: great cafes! I am a bit of a coffee addict and our favorite cafe in Hoi An was 11 coffee. Phap, the owner of 11 coffee, is a great guy and a real coffee enthusiastic. I can totally recommend visiting his cute cafe, we went there almost every day during our week in Hoi An. 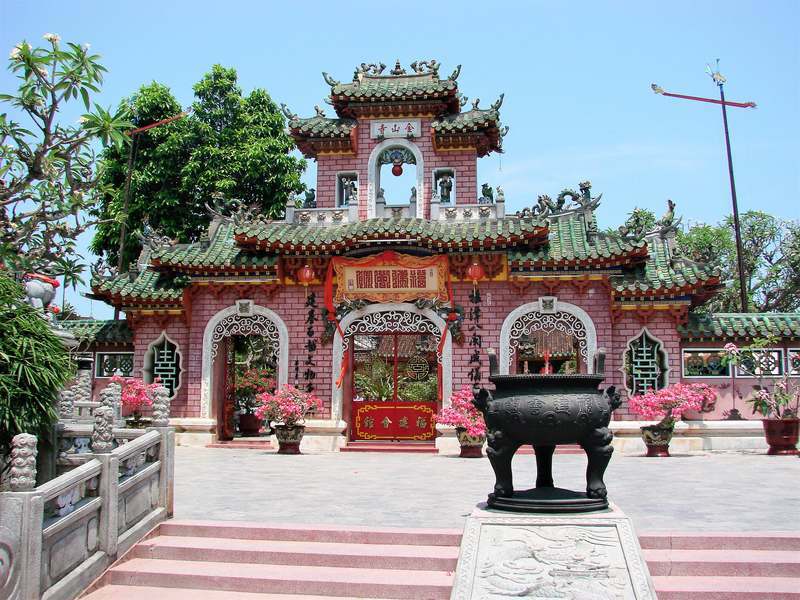 Read about more things to do in Hoi An. Our first hotel in Hoi An was Jolie Villa Homestay. A brand new building, a spacious room with a huge comfortable bed and the bathroom was large, clean and modern. Also, the shower was high enough for tall people such as my husband! Good Wi-Fi (each room has its own router), free bicycles available, free use of the swimming pool at the Kiman hotel (also run by this lovely family) and a free cooking class at the Kiman hotel. The family is awesome, they are so friendly and helpful, calling every guest by name from the moment you arrive so you really feel welcome and at home. Excellent stay, highly recommended! Because all the rooms at Jolie Villa were booked and we wanted to stay in Hoi An a couple more days, we looked for another hotel and found Sac Xanh homestay. Another great hotel, we had such a lovely stay with this family! The rooms are basic but spotless, the bed (with mosquito net) is super comfortable and there are free bicycles available. The absolute best thing about this homestay is the family, friendly, smiling, welcoming and very helpful. They arranged transport for us to Da Nang train station and helped us make a reservation for bus tickets from Nha Trang to Dalat. Also, they made us a delicious Vietnamese breakfast each morning. On the day of our departure the family organized a special going away lunch, the food was among the best we had in Vietnam. Highly recommend to stay here! After a relaxing week it is time to move on, to Dalat to be precise. 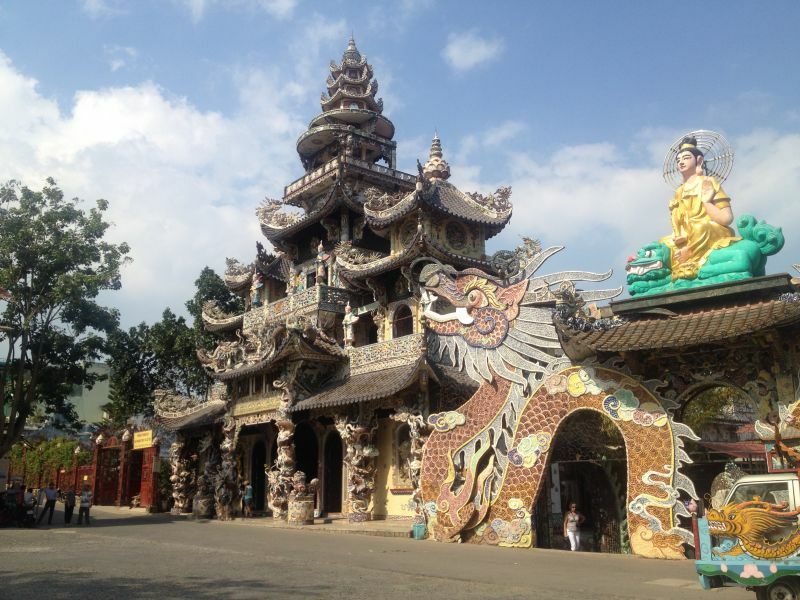 The trip consisted of several legs, starting with a short minivan ride to Danang train station, followed by another night in the train to Nha Trang, a little walk to stretch my legs and get to Phuong Trang bus station, a 5 hour journey on the bus to Dalat and a brief cab ride to Cam Ly homestay. Altogether a 24-hour journey, but thanks to the good night of sleep in the night train and the gorgeous road from Nha Trang to Dalat it did not feel that long! 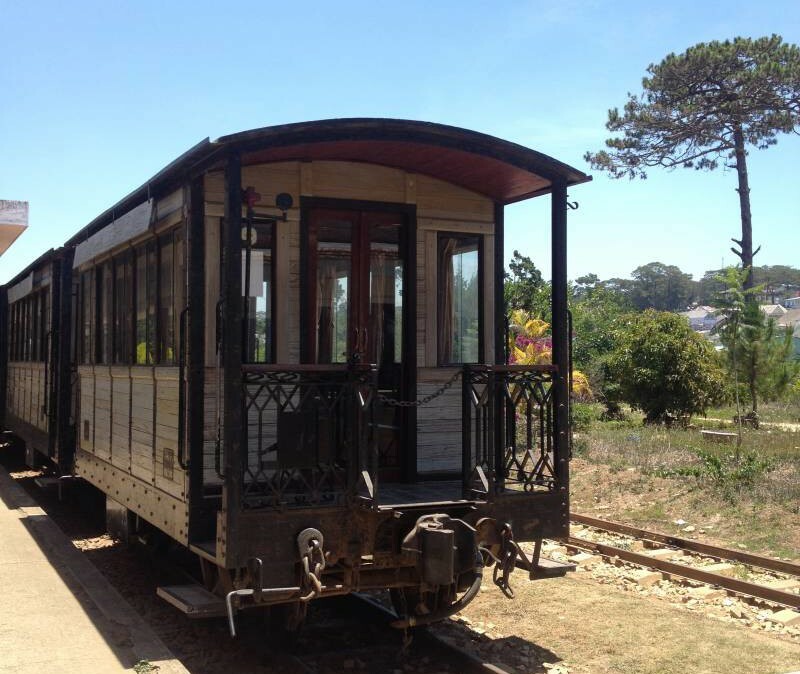 Our stay at Cam Ly homestay in Dalat was also great! When we arrived Tri, the owner, welcomed us by name and showed us to our room. The room had a nice view into Cam Ly stream and a small balcony. Spacious and light room with a comfy bed (with mosquito net). We were invited to the BBQ, a great way to meet other travelers and exchange stories. Good food, a mountain of homemade spring rolls and we ate them all… Cheap beer, great atmosphere and Tri is just the best! When something accidentally broke on the mountain bikes Tri had given us to explore the town, he very understanding and did not charge anything for the repair. It really felt like a home, the family is awesome! I stayed in Dalat for two days, which I spent drinking coffee (grown in the region of Dalat) and mountain biking around the lake, the town and its surroundings. Read more here. Vietnam kept surprising me, after some Google research I discovered there was a shuttle bus service from Dalat to Liên Khương Airport which is located about 30km south of Dalat. Tri, the amazing owner of the homestay, called the shuttle bus the day before I left and the next morning the shuttle bus picked me up from the home stay just 15 minutes late. The flight from Dalat to Ho Chi Minh was short, about 50 minutes. From Ho Chi Minh airport I took bus 152 to the city center. In the bus I was required to buy one ticket for myself and one for my backpack. Granted, my bag took up just as much space as the average Vietnamese person;-) Besides, the ticket was just 5000VND which made it the cheapest airport-city center transportation of my five month trip. Going from peaceful Dalat to the madness of Ho Chi Minh was a bit of a shock. The word that immediately comes to my mind when I think about Ho Chi Minh City is chaos. And scooters. Or actually a combination of these. There are so many scooters in Ho Chi Minh! The rule when crossing the street isn’t ‘Walk when the traffic light is green’ but ‘Don’t mind the color of the traffic light, just cross slowly but surely and maintain eye contact all the time’. Whatever you do: don’t stop! 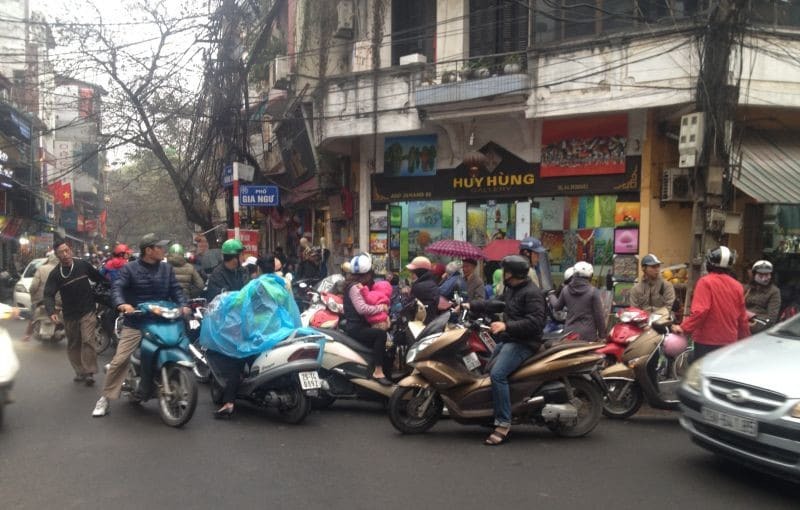 It still amazes me that I have only seen one traffic incident in my month in Vietnam so despite the chaos it all seems to work out pretty well. Of course we did some sightseeing in Ho Chi Minh city. 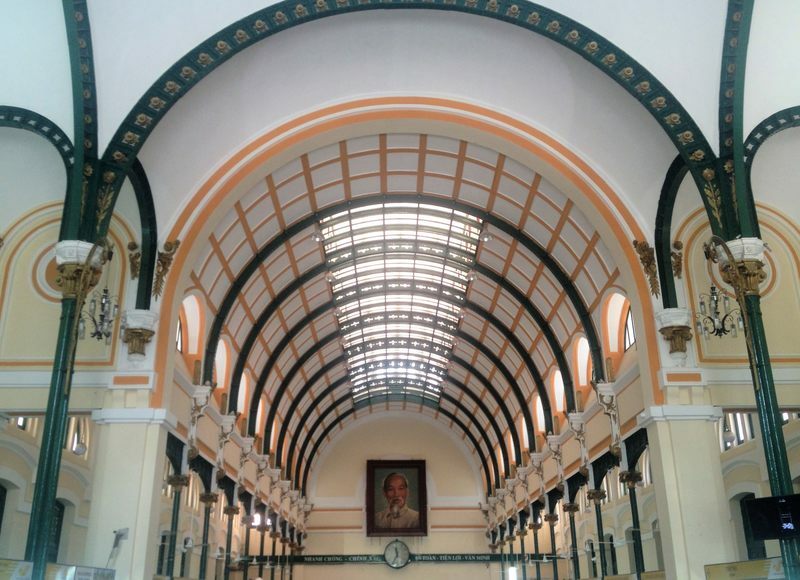 We visited the Mariamman Hindu temple, the Notre Dame Cathedral and the Saigon Central Post Office. The post office was definitely my favorite building, I loved the symmetry on the inside of this beautiful place. I also wanted to visit the Reunification Palace, home and workplace of the President of South Vietnam during the Vietnam War, but unfortunately it was closed. Our stay at Thao Nhi Hotel in Ho Chi Minh city was good; we got a free upgrade to a really spacious room and the hotel is run by very friendly staff. The hotel serves delicious and affordable food and it located close to all sights (in a small street just of the main backpacker street). The one downside of the hotel is that people are allowed to smoke inside so if your neighbor is a smoker your room will smell of smoke. The smell goes away quite quickly though if you open the window and turn on the air conditioning. An easy travel day, I took bus 152 back to the airport and just a one-hour flight (that was delayed for three hours) later I had left busy Ho Chi Minh behind me and landed on Phu Quoc, where a taxi was waiting for me (thank you Kinh Bac Hotel! More about our Phu Quoc hotel below). The airport is located in the middle of nowhere, arranging a taxi beforehand is recommended, particularly when you are arriving late in the evening. We arrived quite late at Kinh Bac Hotel on Phu Quoc due to a delayed flight. Pat, the owner, arranged a taxi which picked us up from the airport. The hotel is brand new and the rooms are large and clean. Scooters are available to explore the island (200000VND per day). Each morning we were greeted by the lovely staff who asked if we had a good rest. The hotel is building a pool and creating a private beach. It is 20 minutes to Duong Dong, the main town, by scooter so the location was the only slight disadvantage of the hotel. • The two hour drive from Ha Tien booking office to Kampot city center, taking me over the border to Cambodia. If I had been staying in Duong Dong itself transportation from there to the Bai Vong pier would have been included as well, but as Kinh Bac Hotel was located in the middle of nowhere I had to arrange my own transportation to Bai Vong. No problem, I shared a cab with other hotel guests taking the same boat. I get motion sickness from time to time and the boat trip from Bai Vong to Ha Tien was one of those times. The sea was pretty rough and the boat was bouncing on the waves… I just kept my eyes closed and tried, unsuccessfully, to get some sleep. Luckily it was not that long (about two hours) before I could set foot on solid ground again. At Ha Tien pier a minivan was waiting for our travel group. The van drove us to a booking office belonging to the same company as the one where I bought my ticket in Duong Dong. At the office a friendly Vietnamese lady gathered all our passports, vaccination booklets and $35 a person and drove to the border to get us a Cambodian visa. We waited for two hours at the booking office, until the office received a call that our visas were processed. Another minivan took us to the border where we got out and the Vietnamese lady led us over the border (my first border crossing on foot! ), gave back our passports now containing a shiny new visa and waved us into yet another minivan that took us to Kampot. Altogether, it was very well-organized! From Kampot city center it was a short ride in a tuktuk to Bohemiaz resort, one of the most pleasant stays of my five month trip! Read more about my time in Cambodia. I started this post by saying that getting around in Vietnam is really easy and I hope this information makes it even easier to plan your trip to this wonderful and interesting country! 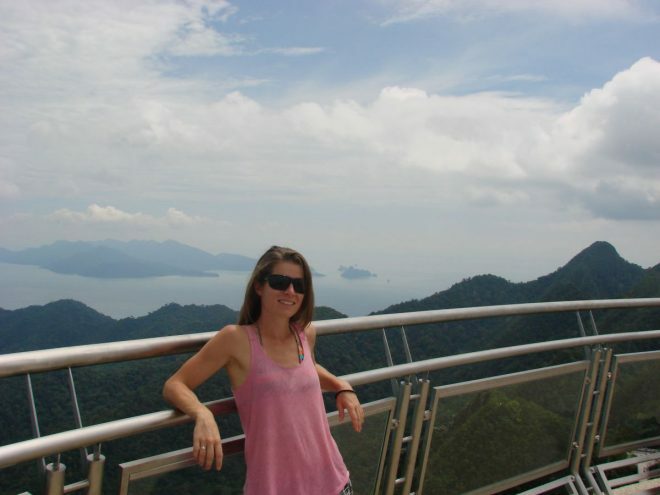 Also check out Janet’s post for more Vietnam travel inspiration! Going to Vietnam soon? 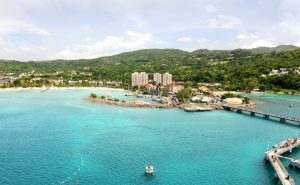 Download the itinerary and hotel information in a printable pdf! Wat een handig overzicht als je naar Vietnam gaat! Het staat nog niet op mijn bucketlist maar wie weet..
Dankje Carolien! Ik vond Vietnam echt een superleuk land en gemakkelijk rondreizen. En het eten… nomnom! Leuk om te lezen en een handig overzicht. Wij hebben veel van deze route gezien behalve Dalat en omgeving. Hoi An vonden wij niet zo bijzonder, te toeristisch waardoor je de sfeer niet zo proeft, maar dat komt misschien ook wel deels door de continue regen (ook de reden dat we Dalat oversloegen). Vietnam vonden wij een heerlijk land en makkelijk om door te reizen. Wij hadden er 6 weken voor uitgetrokken. Het noorden vond ik helemaal geweldig, maar in de winter is het weer elke dag anders. Dat hoort er een beetje bij. Ik wil graag nog een keer terug naar Vietnam! Wow 6 weken in Vietnam, geweldig! Ik vond Hoi An ondanks het toerisme erg relaxt maar wij hadden inderdaad mooi weer en hebben veel rondgefietst, ook in de omgeving van Hoi An waar het een stuk rustiger is. Ik zou ook graag een keer terug gaan! Ik zou het geweldig vinden om Vietnam te bezoeken. Ik zou dan een reis maken en alle overblijfselen en memorials van de Vietnam oorlog bezoeken, maar natuurlijk ook de prachtige natuur en stadjes! Als ik deze foto’s zie, wil ik alleen nog maar meer gaan! Grappig he, dat je beleving van temperatuur zo veel anders kan zijn dan de personen die daar wonen. Gaan wij in de winter naar Marokko bv. dan doen wij luchtige kleding aan, terwijl zij helemaal ingepakt zijn. Kom je van de Fillipijnen af, bevries je weer zowat in Vietnam. Zo te zien heeft het je reisplezier niet nadelig beinvloed! Awesome! It’s always really cool to be shown around by somebody who actually lives there and who can take you to off the beaten track places! Great post, I love that you documented the prices too. We’re going to Vietnam in two weeks and we haven’t chosen our full itinerary yet so your article is a great inspiration! I love that you spend a week in Hoi An LOL 🙂 I did the same! Hoi An is such a cute place with nice food and things to see plus an amazing beach! Phu Quoc island looks wonderful, i had no time for that, maybe some other time? Haha Hoi An is so relaxing, I loved the vibe… Phu Quoc was definitely nice, I’m curious to see how the island has developed in the past 2 years. There was talk of direct flights from Russia and China so it might be very different now.